After eight issues and two years, our resident designer, Jonathan Hitchen has passed on the propelling pencil to our new companions Daniel James and Jacob Critchley (of birthday and Rueville design respectively) working together as team ‘19. Unless you have been living on the moon (lucky you) you will probably know that one of patrons is Johnny Marr - the musician, songwriter and all round nice guy. Johnny has been a great supporter of ours for a few years now. He takes a genuine interest in what we do and when he is not recording, touring or writing will try and get to some of our events. He even pops into Modernist HQ for a chat now and again and let me tell you, that man sure knows how to chat! Last time he was on our sofa he was excited about his up coming tour and especially for his hometown gig at the Manchester Apollo. He was keen that we should do something together and the ideas ranged from the unfeasibly ambitious to the downright daft. Being a big fan of badges (he wore one of our original MODERNIST badges on the David Letterman Show once) the obvious thing to do was a badge. Many people have really liked our badge that was a facsimile of the old GMPTE logo and Johnny really liked it too. After batting around a few ideas we decided to redraw the logo to spell out Johnny’s initials - thus encapsulating many of our favourite Manchester things - buses, badges, modernist logos and Manchester musical geniuses. So the badges will be available exclusively at Johnny’s gig at Manchester Apollo on November 18th. Lots of Johnny’s fans around the world are supporters of The Modernist and hopefully they will enjoy the badge too. If there are any left after the gig they should be available on both our online shop and at Johnny’s website - but they are sure to be popular and as with all the products we do are very limited edition so if you cant make the gig be sure to check the web shops after the 18th. 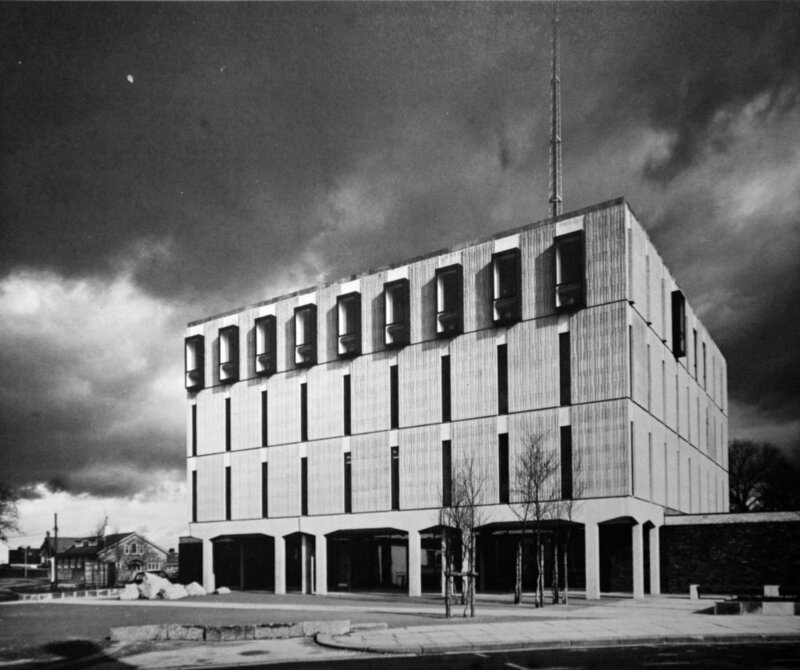 Under the guidance of Roger Booth, the Lancashire County Architect’s Department had a golden era between his appointment in 1962 and the structural upheaval following the Local Government Act (1972) and its implementation in April 1974. Before this restructuring the county incorporated the cities of Manchester and Liverpool and, whilst the major cities took care of municipal works within their boundaries, all of the outlying boroughs of Greater Manchester and Merseyside were under the jurisdiction of County Hall. Booth was the longest serving of any County Architect and his tenure ran until 1983. He began his career in private practice in Kensington in 1949 and he entered local government in 1952. The scale and breadth of the department’s workload was phenomenal. Health centres, schools, colleges, libraries, fire stations, residential accommodation and archives all formed part of the portfolio, in places as far apart as Ulverston and Widnes. The department also included research and development and furniture design groups. The R&D group were involved in experimenting in new construction techniques. In the context of the provision of buildings for the same purpose in many different locations, the logic of systemised building was inescapable. The national history of these systems is well recorded, particularly in school and university construction; the Consortium of Local Authorities Special Programme (CLASP) was founded in 1957 at the instigation of the then Ministry of Education for the purpose of improving the construction and delivery of schools. Leonard Manasseh in his 1964 address to the Architectural Association referred to the ‘Art Boys’ and the ‘System Boys’ as being the two sectors of thought that characterised the era. In Lancashire as well as buildings in the education sector, the department also examined branch libraries, old person’s accommodation and, most notably, police stations as having the potential to be standardised and formed from component systems. The Lancashire school building system was known as GRID, this and the other systems developed in brick, timber and concrete were touted as the ‘first and only serious industrialised building systems north of Nottingham’. Before the advent of explicit systems in Lancashire, it had become common practice to re-use already rationalised details and building systems. The last bespoke police station to be designed was Chorley (1968), accompanied by a magistrate’s court, this station building was almost replicated at Bury (though Bury also had a nuclear bunker and shooting range in the sub-basement!) and the court informed a very similar construction in Leyland. Eventually, police stations in Skelmersdale, Morecambe, St. Helens, Preston, Blackpool and Wigan were all constructed from the same system, developed by the R&D group in collaboration with a local manufacturer. In the initial stages the buildings were conceived as a kit of parts, the assembly of which would be specific to the particular site. The ‘Elemental Design Components’ consisted of operations wing, cell wing, basic ground floor, upper floor plates, service cores and chimneys. In the 1966-67 County Architect’s Report various configurations of these elements were presented as models to demonstrate the flexibility of the system. As the construction system was developed the idea of complete standardisation from the first floor upward was considered. This would permit the ground floor to behave as the site and programme conditions dictated. Before any stations were built four of the textured concrete panels that would come to form the fortified monoliths were assembled in the playing fields of a school in Accrington, which was under construction as the R&D group were at work. This prototype remains in place to this day and had a roof and door applied to act as a shed, it’s referred to in the 1971-73 review of the department’s work as ‘surely the most expensive groundsman’s store ever constructed!’ The intent was to develop a load bearing concrete panel that would transfer its own deadload externally through the façade. The ‘windows’ were conceived as slots to provide vistas, not light, in an attempt to free the internal office planning. The advantages were discussed in terms of this flexibility, the constancy of the internal environmental conditions, reduced maintenance, and the exclusion of noise and dust. Reports indicate that the lack of daylight did not seem to be of concern to the architects at the time. The system was labelled the ‘Heavy Concrete Method’ and was suitable for buildings of three to seven storeys. The first of the stations to be constructed was Morecambe followed by Preston and St. Helens. Blackpool is perhaps the most dramatic of the group, the high level plazas, now devoid of anything remotely green, have a dystopian atmosphere. In a Buchanan Report meets Logan’s Run landscape of chamfered and diagonal hard surfacing, a series of squares link, and are framed by, the police station and a magistrate’s court. The court building itself is by respected local firm Tom Mellor & Partners and has a low slung horizontality that contrasts against the keep like monolith of the station office tower. This is not the first time terminology usually reserved for the description of castles has been levelled at the stations, apparently the question ‘are the police to be issued with bows and arrows?’ was not uncommon. From today’s perspective it is easy to see how these structures can be perceived as authoritarian and following tumultuous events in recent history this is not an image that the modern police force necessarily wishes to project. The intent of the architects at the time, quite contrarily, was to allow the ground floor to seamlessly integrate with well-designed public space and for the solid upper elements to make positive contributions to the townscape within which they were set. The stations are being slowly replaced with new facilities; the buildings in Preston and Wigan no longer house the police. In many respects these schemes would have sat comfortably in the minimal canon of the early 1990s and the term ‘monolithic architecture’ readily applied. Arguably before their time in aesthetic, yet not necessarily ‘progressive’ in their use of system building components, there is a clear sense that these schemes could not have existed outside of the very specific conditions in which they were formed. The post-war period, Booth himself, the experimental and well funded department and the associations between local government and the emergency services all had their bearing on ‘police brutality’. This article is based upon an examination of the reports of the County Architect held at Lancashire County Record Office. The author wishes to acknowledge the help and assistance of the attentive staff of the archive. Chaque jour est identique, et chaque jour différent. comme autant de vies anonymes. de ceux que l'on ne croisera jamais en bas. le ballon vert brillant monte et descend. La ville doit être regardée, avant tout les tours. par la tour métallique et nue de notre imaginaire. m'a dit que l'hiver arrivait finalement sur sa terre. Bonne soirée, Madame, j'ai répondu. © Hannah Darabi & Benoit Grimbert. A frontier land facing the English channel, the coast of Romney Marsh has long been the last line of defence against foreign invaders. Strong fortifications — the round, brick masses of Martello towers, a redoubt fort atop a grassy mound at Dymchurch and, closer inland, a military canal — still stand, centuries after they were built to withstand the advances of Napoleon, an enemy who never came. It was this lonely, windswept stretch of coast, on the edge of the country and on the way to nowhere, where the painter Paul Nash chose to recuperate after witnessing first-hand the brutalities and destruction of the first world war, first in the trenches at Ypres and then as an official war artist. When peacetime came, Nash took a small house, Rose Cottage, in the sleepy seaside village of Dymchurch, Kent. In the 1920s, he produced a series of paintings of the sea wall which stretches around the bay, built to defend the Marsh from the ongoing and ever-present threat of the sea. In front of the wall, at low tide, the sands stretch out into the horizon, a thin surface of water creating a reflective sheet that catches the changing colours of the Marsh sky. The sea’s ripples etch themselves into the sand and small streams spread as if stretching out networks of roots. At high tide, waves churn against the rocks shoring up the wall and submerge the steps that take walkers down onto the beach. The other side of the wall lies Dymchurch, at the edge of the vast, flat Marsh, scattered with sheep, occasional settlements and winding country roads. It's thought that the sea wall which dominates this stretch of coast dates back to Roman times. In the fifteenth century, a ‘scot tax’ was demanded of all local landowners. If they lived above sea level they were let off — scot free. Later, in the eighteenth century, the wall was repaired with earth and branches from the Marsh. At the start of the nineteenth century, a three mile-long section was constructed using Kent rag stone and concrete. Today, you can see where the wall has been added to and extended in the different shades of concrete, which is flecked brown with the same shingle that collects at the edge of the beach below. The wall curves inwards around the coast, mimicking the rolling of the waves beneath and acting as both a shelter/windbreak for holidaymakers underneath it (from sand, from rain) and a barrier to contain the waves, scooping them up and sending them back out to sea. On the bleakest of days, the grey of the sea wall reinforces the grey of the sea beneath and the sky above. Nash’s seascapes are often empty and stark, their colours hyperreal (see the dark greens, mustard yellow and forceful black of ‘Sea by Night, Dymchuch/Night Tide' or ‘Wall Against the Sea’, which casts the bay in the type of ominous, sickly glow that only occurs preceding a storm). Forms are simplified and suggested; the manmade and the natural merge into one. In ‘The End of the Steps’, a quiet scene dominated by the bulk of an impenetrable-looking concrete defence, the sharply angled sky looks as much of a construction as the manmade object. In ‘Winter Sea’, a fragmented sea sets out in massive slabs, shaded grey, black and white, towards a faint moon, like the regular descent of stone steps. When figures appear, as in ‘Promenade’, they turn their backs to the viewer, just as the wall turns its back on the village. In ‘Night Tide, Dymchurch’, the solid back of the solitary night time walker appears as just another line in the defence. It's this sparseness that makes Nash's seascapes the most powerful of his paintings: the emptiness of the sands amplifies feelings of solitude and loneliness, emphasising how small the human is in relation to the vast natural world, and brings to mind the strange semi-silence in the air, found only by the seaside, that multiplies the lone walker's thoughts, doubts and preoccupations into a background roar as inescapable as that of the sea. Nash was of a generation that fought and suffered for the right to make a modern world, to sweep away the old and, out of chaos, build stability. In Romney Marsh, it’s as if time stood still. The view around the coast has changed little, save from the odd holiday park, new residential development and the sizeable bulk of Dungeness power stations in the distance. Nash left Dymchurch after a few years, moving a few miles across the border to East Sussex. The next decade, the world was at war again and Nash painted propaganda, before dying young after suffering years of ill health. The Romney Marsh coast once again played a part in the war effort: the Martello towers and the redoubt fort which, with each decade, grow closer to crumbling into the sea, were requisitioned as lookout points and stationed with anti-aircraft guns. The war was won but the fight against the sea goes on. In the past decade, the sea wall has undergone extensive renovation, using precast and poured concrete and steel reinforcement, and was reopened in 2011. It’s a battle that will never finish: the metal has already started to rust and bleed into the wall, and the concrete is taking on the sea’s bright green, mossy sheen and dappled black and yellow bloom. The North East has an unexpected relationship with all things brutal. Its landscapes have inspired such distopic images as Ridley Scott’s apocalyptic ‘Blade Runner’ and the bleak, grainy photography of Don McCullin. Even James Stirling once referred to the industrial wastelands as the landscape of ‘satanic slag heaps’. In the industrial boom of the post-war decades, architecture found a language that responded directly to the inhuman, mechanised prospect of the region’s burgeoning steel works and petrochemical enterprises. It was an architecture that responded with integrity to the chastened social wants of the industrial towns and mining villages, to the callousness of the steely grey skies, chimneys and sea. Redcar library was an exemplary building of this kind. Tucked away from the noise of the sea-front arcades and fish and chip shops, the library exemplified the changing attitudes of the time towards learning, culture and education. Redcar led the way for new public buildings of this kind, moving away from the elitism and civic pomp of previous generations, and introducing social aspects like coffee shops, exhibition spaces and children’s play areas into the library building. The space was laid out as a large, flexible public space, recognisable as a library only by the shelves of books, the building itself a single storey mass of folded iron roofs, formed by castellated steel beams that spanned the entire width of the interior. The portal frame was an integral feature specified by the council to allow the building to be flexible – it was part of the long term ambition for the library in its changing social and cultural role. The deep industrial-sized steel beams were contrasted against warm, soft materials like the burnt orange carpet that ran throughout. Redcar library extolled the virtues of civic buildings playing a vital cultural role in public life, a reflection of the egalitarian ideals and social ambitions of the town and a symbol of where Redcar wanted to be in the late 1960s. More than that, it was an example of a sort of modernist vernacular – a kind of Brutalist architecture that grew out of its place. The folds and creases of the library roof ripple like the steely North Sea waves. The brazen exposure of its steely construction was a warts-and-all declaration of where this building stood; at the centre of a small seaside town in the shadow of Europe’s largest steel manufacturing plant; ‘a hymn to steel'. In 2011, Redcar and Cleveland council announced the ‘Redcar Civic and Leisure Quarter’. It would see the demolition of the 40 year old library and its replacement with a cluster of new quasi-public buildings; a sports centre, new civic centre and a replacement for the library building. The 1960s library at this time was only just reaching maturity and like all buildings of that era, it was beginning to show signs of its age. Its fabric was leaky; the roof, built as it was, entirely from steel and glass, acted as a vast cold bridge. The sea spray had stained the gnarly steel work with rust like all seafront buildings in the town. But the steel roof was the defining character of the building. The trusses enabled its open plan interior, modelled more on the social hub of an agora than the solitariness of the traditional library building. The construction in steel reflected the pride of the town council, eager to exhibit local manufacture. It is an expression, even an extension of the context in which it is bound. And as it approached ‘middle-age’, its signs of weather and wear became emblematic of the battles fought over the previous decades, the political, social and economic hardships that had beset the town. The announcement to demolish the building came at the end of a year that saw the steelworks slowly and definitively closed down; the largest blast furnace in Europe stood cold on the town’s horizon. The demolition of the library was pitched politically as a regenerative boost to the town’s economy; the creation of jobs and employment prioritised over the retention of Redcar’s recent architectural heritage. The steel frame would be dismantled, synchronized with the decommissioning of the neighbouring steel works, the town’s former identity slowly and painfully cleared for rebuilding. Towards the end of last year the steel works were suddenly bought up; their fate re-written. The blast furnaces started up again. The library though was already condemned. Political will had forced through its demolition to make way for Redcar’s new era and new service-oriented identity. For all that it might have looked gnarly, weather-beaten, brutal even, the library reflected an inimitable sensitivity to place. It symbolised an era of ambition and idealism, and exemplified, even celebrated, the steelworks that were, and continue to be, the lifeblood of the region. In the moment prior to its demolition, it stood as a monument to the bittersweet history of the town and its demonic neighbour. Now demolished, the library’s vacant site sits as a guilty reminder of its brutal disregard. On one of the steep slopes that rise towards the centre of the city all the buildings have been destroyed within the past year: a whole district of the tall narrow houses that spilled out from what were a hundred years ago outlying factories has gone. The streets remain, among the rough quadrilaterals of brick rubble, veering awkwardly towards one another through nothing; at night their rounded surfaces still shine under the irregularly-set gaslamps, and tonight they dully reflect also the yellowish flare, diffused and baleful, that hangs in the clouds a few hundred feet above the city’s invisible heart. The ‘half-built towers’ that stud the ‘bombed city’ are themselves structures threatened by the ‘perfections of tomorrow’; their mouths momentarily gape open as if stunned, but they, too, will soon be ‘stoppered’. In a city assembled from ‘soot, sunlight, brick-dust; and the breath that tastes of them’, it is easy enough to ‘lie women in your bed / With glass and mortar in their hair’, but whether their trashy tiaras are made from the detritus left by wartime shelling, or by machines sent in by developers, or by slums that have begun to blister and shed themselves of their own accord, it is difficult to tell. If the poem’s speaker is worried about becoming a ‘cemetery of performance’, then so too is the city he speaks of. ‘There is’, the poem spits, ‘no mind in it, no regard. […] Most of it has never been seen’. The ‘invisible heart’ of this unseen, unthinking ‘City’ is in fact the ‘Heart of England’: the Industrial Revolution’s vital organ and Fisher’s own place of birth. Birmingham’s industriousness, in other words, is Fisher’s generative material, and Birmingham’s industry has clearly had massive implications for its urban form as well. In the cityscape that came into being in the early nineteenth century, and which persisted into the 1960s, small manufactories and workshops rasped and sweated in structures indistinguishable from abodes. In the early twentieth century, big industries such as car building generated far larger factories and line after line of tunnel-back terraces. The city’s embrace of the opportunities for slum clearance and municipal redevelopment facilitated both by successive Town Planning Acts and the devastations of WW2 resulted in a cityscape actively and drastically altered: flats and houses equipped with toilets and running water superseded the spawning clusters of back-to-backs; zooming bypasses and ring roads built for automobiles sent pedestrians underground, and sometimes up and over. The tangle of motorway interchanges that is Spaghetti Junction is the location most deserving of Birmingham’s popular assignation as a concrete jungle. In combination, these transformations have earned Fisher’s unthinking city a reputation that is unthinkingly reeled out repeatedly. Birmingham is ugly. Birmingham is brutal. The city’s current authorities appear to agree. The general disdain towards Birmingham’s ‘ugliness’, its concrete brutality, is often implicitly participated in by the city itself. True to its motto of ‘Forward’, adopted following incorporation in 1838, Birmingham is once more in the business of demolition and redevelopment. The building that currently best epitomizes this process is Birmingham Central Library, an inverted ziggurat designed by the Birmingham-born architect John Madin, who died in January. It opened, as the largest library in Europe at the time, in 1974. Initially conceived of as part of an ambitious but ultimately unrealised civic complex, the structure has since accumulated its own detritus. Located in a core area of the city called ‘Paradise Circus’, the library’s once open-air interior atrium – a feature that allowed the reading rooms to be illuminated with natural light – has been boxed in and stoppered with fast-food counters and shops. The view of the ziggurat formation from the adjacent plaza, Centenary Square, has been strangled by a nearby hotel, whilst signs and hoardings infest a pre-stressed concrete façade that was once assuredly unornamented. Despite being the UK’s second most visited library in 2010-2011, the building now is, the authorities claim, unfit for its contemporary purpose; a new facility is in construction nearby. The Central Library itself seems fated to be expelled from paradise. The city’s resolve to erase a building so unabashedly Brutalist in architectural style is without doubt tangled up with Birmingham’s industrial legacy and its ongoing negotiation with its designation as ‘ugly’. In Fisher’s ‘City’, ‘the straight white blocks and concrete roadways’ already built by the 1960s are ‘a fairground, a clear dream just before walking’ and even ‘a little ingratiating’. It is, by contrast, the older cityscape of ‘workhouses and […] hospitals, the thick-walled abattoir, the long-vaulted market-halls, the striding canal-bridges and railway viaducts’ that is seen to amount to ‘an arrogant ponderous architecture’ – one that ‘dwarfed and terrified the people by its sheer size’ and ‘functional brutality’. Brutality, ‘City’ teaches us, is to be found in the chasm between a building’s aesthetic attitude and its social corollary and context. Brutalism is something different: a response, an enunciation, a revolution of existing conditions. In terms of its provision of public space, facilities and possibility, Madin’s building was a pioneer. In Fisher’s 1960s poem, Birmingham’s ‘towering and stony’ ‘great station’ – Curzon Street Station, possibly – has become a ‘goods depot with most of its doors barred’, but its ghost remains: ‘They are too afraid of it to pull it down’. In 2012, the authorities are all too eager to disassemble Birmingham’s ‘functional brutality’ – a brutality they mistakenly locate not in ‘workhouses’ and ‘thick-walled abattoirs’, but instead in a Brutalist library. Honor Gavin is a writer, musician, and founding member of whenwebuildagain.org, a collective who take their name from an influential piece of research into housing issues and conditions in Birmingham in the late 1930s. Why is Brutalism in England so reviled? Perhaps growing up in Australia helped me to appreciate it. Under the close Australian sunlight the roughly textured béton brut concrete tends to gleam translucent, flattening into stark geometric planes which reveal themselves in harsh light and shadow, even as they seem to grow out of the landscape. One of the most accomplished examples of Australian Brutalism is the University of Technology’s Ku-ring-gai campus on the outskirts of Sydney, designed by David Don Turner and Bruce Mackenzie, a building complex whose primal, futuristic concrete geometries rise up out of the bluegums like spaceships; ancient temples rediscovered in the bush. In Britain however, Brutalist architecture takes on a more sinister tone, as this same concrete looms dark and heavy under grey skies. I am here reminded of the importance of light to architecture and how it can transform a building completely, both inside and out; for under the layered, leaden light of the northern hemisphere, the effects of Brutalism seem so different to those formed under the direct, immediate Australian sun. In Australia, Brutalism was the style of choice for many of the important institutional buildings of the 1960s and 70s, including the university campus where, for five years, I was instructed in architecture. But in Britain, the Brutalist style of building was deployed to satisfy the urgent demand for cost-effective post-war housing on a mass scale. It was also, as Banham noted, frequently associated with socialist utopian ideals, and dreams of collective living (most notably by the British architects Alison and Peter Smithson), and because of its attachment to utopian thinking, seemed doomed to disappoint from the start. Australian Brutalism never suffered this fate, and seems, like most Australian architectural movements, to have escaped the justification of its own existence by the imposition of a strained and often arbitrary theoretical discourse. Nevertheless, in Australia as well as in England, Brutalism’s aesthetic bad name is largely undeserved. There is no doubt that it is a style out of current favorites, and this isn’t helped by the signature use of unrendered concrete, which has an inevitable tendency to weather quickly – giving a characteristic appearance of accelerated dilapidation and an abject visual poverty. In a city and a society where the signs of aging are equated with declining moral standards, there is no doubt that Brutalist housing estates have been slugged with the blame for London’s social problems, as politicians scramble to point the finger at scapegoats. And so, in a move repeated throughout the history of city planning, politicians will again assume that it is not the policies they enact or the laws they pass that are to blame for society’s dysfunctions, but simply architecture. Furthermore, in a self-contradictory leap of reasoning, they will also assume that as much as architecture seems to be the cause of the breakdown of communities, it must also be pegged as their salvation. Then, by way of an attempted solution, an old development will be torn down; a shiny new one erected, and the far-reaching roots of the city’s social problems swept perfidiously under the carpet. There are of course many problems with Robin Hood Gardens, though it must be said – and the majority of residents that have spoken to the media seem to agree – that these problems stem more from a lack of maintenance than any intrinsic fault of the design itself. Buildings must be maintained - services must be replaced, concrete must be cleaned, facades must be repaired, windows must be refitted, interiors must be updated. This all costs money, and the longer any building goes without ongoing maintenance, the more expensive that maintenance becomes. The quality of a building can often be determined by how it weathers, and it seems to me that Robin Hood Gardens has, for all its neglect, stood up remarkably well in this regard. The Smithsons may not have been verbally tactful architects, but they certainly knew how to build a building to last and to endow it with a quiet dignity and a subtle beauty that is far from brutal – despite its sheer bulk and heavy mass. In fact, it is the combination of a heroic overall scale with the deployment of delicate proportions in the detail that strikes me as one of Robin Hood Gardens’ great successes. The facades of the two rectangular ship-like forms that hug the curves of the grassy, treeless hill at the center of the site are remarkably complex in their formal articulation and speak of an organization of well laid-out apartments behind their concrete skins. The sky is mostly grey the day I visit Robin Hood Gardens, but later in the afternoon, the sun does come out briefly. When it hits the concrete, the rays play off the nuances of depth built into the facades, laying down a patterned rhythm of shadow and light on the weathered panels. Strangely I can at this moment almost fancy that I am back in Sydney, a city that is, now that I no longer live there, composed architecturally in my mind almost exclusively of flashes of sun and the tactility of rough-hewn, hot concrete. 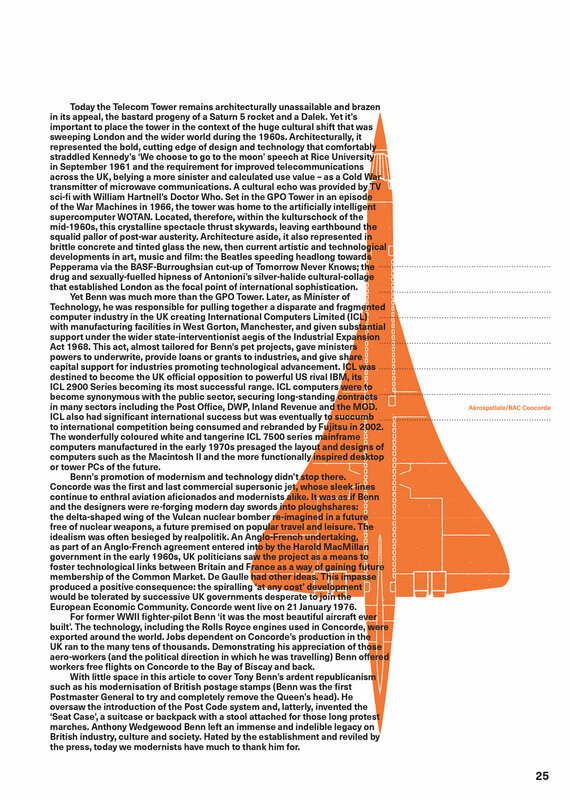 Emma Jones is an architectural graduate from Australia with a passion for inter-war modernism and post-war Brutalism. 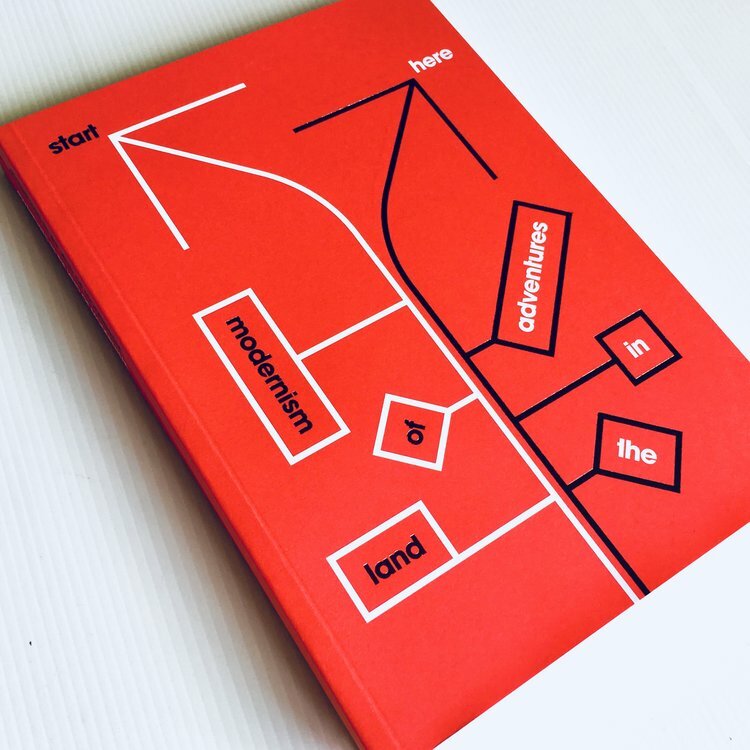 She has recently completed an MA in History and Theory of Architecture at the Architectural Association in London, where she currently teaches First Year architectural theory. Just behind Chorlton Street bus station on Richmond St, sits an unprepossessing, derelict building with a most significant place in Manchester's 20th century architectural history – as possibly the earliest surviving completely concrete building in the city centre dating, thanks to a date stone (cast in concrete obviously) at the apex of the building, from 1911.
good in compression, supporting great weights in a solid block, it is liable to crack in slender structures. Steel on the other hand is weak in compression but strong in tension. Combine the two, as Frenchman Joseph Monier did in 1849, and you have almost the perfect building material, one that can in theory be moulded into an infinite range of forms and shapes. Francois Henibique perfected the technique in 1892, exported the license to use it around the world, which was picked up by L G Mouchel, who promptly set about reshaping our buildings, most famously the Royal Liver Building in Liverpool, its structural frame constructed out of reinforced concrete. Meanwhile, in Manchester, the architects of the YMCA building on Peter Street used a similar system developed by the American architect and engineer Albert Kahn, which, like the Royal Liver Building, is merely a concrete frame clad in more traditional materials. At Richmond Street, the building's exterior is concrete, making a strong case for declaring it Manchester's earliest surviving Brutalist building. Yet for the next fifty years concrete was rarely used as an aesthetic outer treatment, instead relegated to construction material, favoured in utilitarian and industrial buildings. Manchester City Football Club had concrete terraces built by Mouchel, and the huge concrete Grain Elevator 2, built in 1915 at Salford Docks at Dock 9, proved so resilient that when demolition contractors tried to demolish it in 1983, it refused to fall and lay at a precarious angle for months. Wythenshawe Bus Garage, built in 1939, is another excellent example of pioneering concrete construction. Its daring reinforced concrete barrel roof, now recognised by a Grade II listing, creates a huge span of 165ft predating the perhaps more famous Stockwell bus garage in London. The immediate post war period saw what little construction there was maintain a pre war palette of materials - Peter House (1958) is clad in Portland stone, typical of the well mannered almost Classical type of modernism that prevailed in the 1950's - but shortages of timber, steel and brick inevitably helped push concrete from being a rather mundane, if useful, material into becoming an architectural statement in its own right. Manchester’s City Architect, L C Howitt, began to push the boundaries of both the materials used and the form of some of the city’s more prominent buildings. Just one year after Peter House, the Toast Rack, designed for the Hollings College, appeared in Fallowfield. Like many of his contemporaries Howitt was beginning to use concrete in a bold and radical new way, with the soaring parabolic arches that give Hollings its unique shape, speaking a whole new architectural language, whilst advertising on a huge scale concrete’s unique qualities. This golden age boasts numerous examples of innovative concrete technology, with Manchester based architects Leach, Rhodes and Walker at the forefront. Highland House on Victoria Bridge Street (now Premier Inn) used pre cast concrete panels, built off site and attached to a concrete frame. Supposedly the first time a tower crane had been used in the city, its appearance caused quite a stir. Even more radical, at Manchester House on Bridge Street, concrete floor plates were cast on top of each other in situ, and then jacked up into their eventual positions. Ahead of its time and prohibitively costly, it was to be decades until this process re-emerged, facilitating the global construction of very tall skyscrapers. Meanwhile architects and artists were testing its versatility and malleability to create sculptural forms within the architecture itself or as stand alone works, such as the gable end of City Tower at Piccadilly Plaza, said to acknowledge Manchester's history in computing and representing electronic circuitry, giving relief and texture to what otherwise would have been a plain, flat wall. Likewise the concrete gable of the Humanities Building at the University of Manchester has a pattern designed by the sculptor William Mitchell (see the modernist issue 3). Concrete also makes a strong architectural and artistic statement at the wall running along London Road which delineates the UMIST campus. Designed by the artist Anthony Hollaway, it uses the material’s robustness and subtly to create a functional yet intrinsically sculptural structure. More a passionate fling than a full on affair, this interlude soon waned, and as the spectre of Post Modernism reared its head, concrete returned to its former role – as a ubiquitous but functional and largely hidden material. Recently Manchester boldly attempted to rekindle that old flame when the Japanese architect Tadao Ando was given the job of remodelling Piccadilly Gardens. Renowned for his minimal, beautiful, and invariably raw concrete structures, Ando leaves the impressions of the form work (the 'moulds' that the concrete is poured into to create the structure) intact, a ‘signature’ style designed to showcase the material whilst simultaneously celebrating its construction method. Such has been the controversy and criticism of the resulting pavilion it is clear that the British public is still not ready to embrace concrete, and so it shall again remain hidden away – holding our buildings up whilst quietly and bashfully being beautiful. 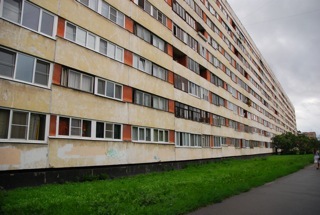 When the opportunity to visit the former Eastern Bloc presented itself I thought a wonderful chance to present readers of the modernist with photographs of fantastic, faded Soviet tower blocks and crumbling Communist monuments was on the cards. Only a fifth of the city survived the Second World War and the prospect of an almost total post-war rebuilding project would surely leave me spoiled for choice? As it happens, the gems were surprisingly few and far between. The more distant past and the contemporary dominate. The old city has been painstakingly resurrected as it was pre-destruction and is a UNESCO World Heritage Site. At the other end of the spectrum, much of central Warsaw is starting to look like any other Western urban environment, with 20th Century buildings making way for generic glass towers in homogenous, you-could-be-anywhere streetscapes. Inevitably, few Varsovians who experienced life in the People's Republic of Poland find much to love in architectural reminders of all too recent oppression, and such buildings aren’t high priorities for conservation. There are, however, younger residents who lack the Commie baggage of the older generations and champion the 1945 to 1990 city as vital to shaping their identity. Some of them are starting to champion the era in question and change the consensus that encouraging decay as an excuse for demolition is the best course of action. The recent renovation of a train station is one such example of the city’s burgeoning affection for postwar modernism. Powiśle Station, designed in the mid Fifties, is one of many rail buildings by Arseniusz Romanowicz and Piotr Szymaniak, and like much of Romanowicz’s work, presents a much more graceful and idiosyncratic vision than stereotypical bleak Bloc blocks. Centrala are the young architects — a self-proclaimed ‘designers task force’ — behind the reinvention of the dilapidated Powiśle as a café and cultural hotspot. Interestingly, they also initiated the process through a campaign that increased affection for the beautiful building amongst Varsovians through the daily free papers. The once run down Powiśle district is now undergoing a renaissance, thanks in part to Centrala and also because of the Świętokrzyski bridge connecting with Saska Kępa, a sedate and refined inter-war enclave. Together with Zoliborz to the north, Saska Kępa showcases the leafy and desirable modernism of the 1920s and 30s rather than monolithic municipal housing blocks that Warsaw had conjured in my mind. Completed at the turn of the Millennium, the concrete and cable Świętokrzyski is one of a handful of contemporary additions to the city worth admiring, complete with a Chopin-inspired black piano key top, after one of Warsaw’s most celebrated sons. In the heart of the redeveloped city centre sits another Romanowicz building of note: the strangely charming Centralna Station. Much larger and far uglier than his other delicate masterpieces, and is surviving despite repeated calls for its demolition. With Stalin’s 1950s gift, the former Communist Headquarters (now the Palace of Culture and Science) looking more like something out of Batman than modernist, a solitary tower block rising above Powiśle Station was left to satisfy my demand for typical Soviet mass housing, and even that possessed a redeeming quirkiness. What most impressed me about Warsaw’s modernism was the changing attitude towards it. 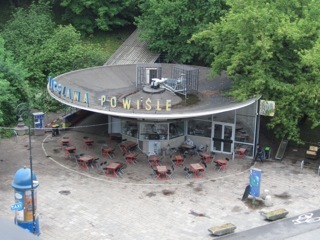 Centrala using Powiśle to provoke change in the opinions of Varsovians and going on to show how such neglected pieces of infrastructure could become prized assets seems to perfectly encapsulate an attitude sadly lacking in the plans for such buildings the world over. That this has originated in a place with an actual reason to want to distance the recent past is all the more incredible. Aesthetically and functionally, however, the designs of Karel Prager, Vladimir and Vera Machonin and others, have stood the test of time and are starting to receive the local and international acclaim that they deserve. Much like the myth of the Czech ‘return to Europe’ post-89, Prague did not need to “return to the international architecture scene” after the cold war, it had always been there. This realization has dawned as Czech brutalism not only takes its place in the international pantheon, but it increasingly stands out amidst the contemporary commercial banality. The former federal assembly building (Prager) at the top of Wenceslas Square has been fully refurbished to mark its highly symbolic transformation into part of the national museum and the Kotva department store (Machonin & Machoninova) is a reassuring presence opposite the recent and hideously Disney-like Palladium shopping centre. Hotels such as the Intercontinental and President downtown and the Praha and Pyramida further out have long catered for the Modern traveler, while commercial buildings such as the Smichov Komercni Banka and the Cube office complex show the range of brutal beauty in Prague. Being a modernist needn’t be a full time job. We could all do with a break from time to time, but going on holiday doesn’t mean you have to leave your modernist predelictions at home. 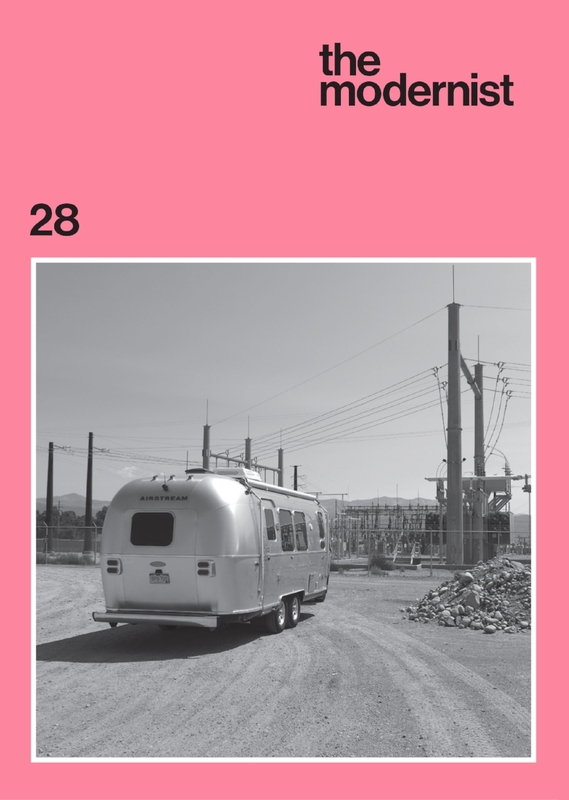 Wherever you like to spend your holidays – resting in a Soviet sanatorium, travelling through the mid-west of America in a mobile home or eating candy floss in an amusement arcade in Llandudno – we we have the perfect destination for you in this issue. Fantasy? This was UK Government policy until the early 1990s. Planning for the Cold War by the ruling elite was brutal indeed and this is reflected by its surviving structures. RSG 10 may still be there but UKWMO (Warning & Monitoring Organisation) Western Sector headquarters survives in Langley Lane near Preston (Grid SD 540365): a massive structure almost buried underground except for a guardhouse and ventilation blocks. Over a hundred people staffed it during exercises. It was stood down in 1991. It had a canteen, male and female dormitories, an elaborate control room, diesel generator, huge oil tanks, communications equipment, airlocks and stores. Imagine an underground three storey office block: a squat, giant tumulus brutally protecting a small elite, excluding us to die. Architecture and engineering have always been the running dogs of wealth and power. Consider Edward I’s Welsh castles or George III’s Napoleonic refuge in Weedon. Modernism was no exception. There’s a direct line from Mendelsohn’s 1921 Einstein Tower, Potsdam, to the ‘streamlined’ Noirmont tower on Hitler’s Atlantic Wall in Jersey. Many Cold War structures have a ruthless functionalism, stripping away democratic pretentions with their raw power. Probably the most Ozymandian structures in Region 10 are the remains of the Blue Streak missile experimental testing site at Spadeadam, near Brampton, Cumbria (pronounced ‘spade’ ‘adam’). Blue Streak, an Intermediate Range Ballistic Missile, was tested there. It was designed to deliver a nuclear warhead to Moscow in 20 minutes. The giant concrete stands used 90,920 liters of water a minute during rocket tests. Work started in 1956, testing in 1959. The plan was, after testing, to ship the rockets –built in Stevenage - to Woomera, Australia, for launch. Handover to the RAF was to be January 1963 but Blue Streak was canceled in 1960. The stands remain at Spadeadam, the RAF’s hush-hush Electronic Warfare Centre. Matthew Hyde, in the Pevsner Buildings of England Cumbria, writes: ‘These mute remains have a stark beauty of their own. Although their forms should be dictated only by function, a sinister aesthetic has been at work’. The project, offering cheap housing, attracted skilled staff to the area. A nice survivor is Millfield, Brampton, a road of Festival-style staff housing. 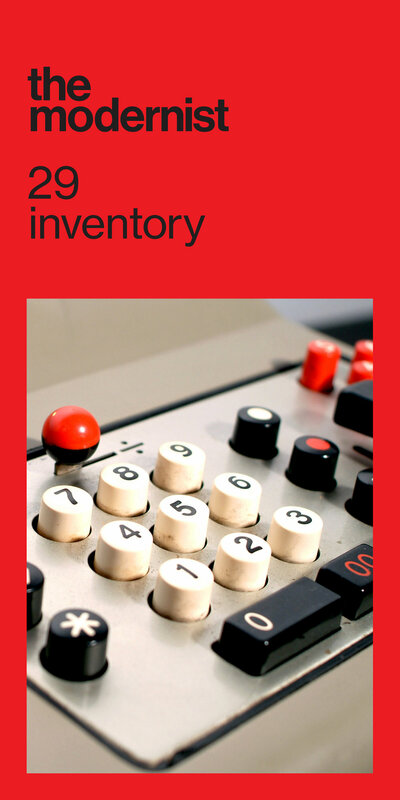 Emergency HQs rely on secure telephone cable and microwave communications. In nuclear war 95% of phones are cut off. Telephone switching exchanges were hardened and reconstructed underground such as the ‘Guardian’ exchange in central Manchester. Walk along George Street to glimpse part of the surface structures. In 1955 work began constructing the ‘Backbone’ network of communication towers, linking London and the rest of the UK. Backbone avoids Manchester but it crosses to Quernmore, Lancs, from Hunters Stones, Yorkshire. One very visible local structure is Heaton Park microwave tower, part of the BT Microwave tower network originating from the BT Tower in London. This links with other towers. Some are concrete; others are functional steel pylons. One of the most conspicuous is London Road repeater station, Carlisle, built in 1964. The mast is 81 meters high. Matthew Hyde enthuses: ‘It is quite thrilling to look at, a steel skeleton in diminishing tiers, each with a perimeter platform, and now festooned with dishes; a touch of Blackpool, a touch of oil rig’. Near Carlisle, at Anthorn, is the impressive MOD radio mast array erected in 1965. It’s a giant circle of stayed radio masts transmitting very low frequency (VLF) communication to nuclear submarines. Hyde calls it ‘oddly festive’. Don’t forget Jodrell Bank radio telescope. It first recorded Sputnik’s squawking pips announcing the USSR’s mastery of space in 1956. What else did it observe? Not all Cold War designs were elementally severe. The V-bombers (Valiants, Victors and the delta-winged Vulcans), which were designed to deliver Mutually Assured Destruction and were continually alert for action, had a powerful elegance. There were no V-Force bases in the North West; the nearest was RAF Finningley. But Vulcans were tested at Avro’s works at Woodford near Wilmslow. I remember, as a boy, lying in the warm grass gazing at the lumbering black triangle of a Vulcan flying overhead – straight out of an L Ashwell Wood drawing from Eagle comic: thrillingly, terrifyingly sublime. The Cold War ended and the UKWMO was disbanded. You can now visit English Heritage’s Cold War bunker at Acomb, York, a Group ROC HQ, much smaller than Langley Lane near Preston. East Germany, Poland, and the Baltic States are in the EU. But the UK still has Trident nuclear weapons and that means structures. What’s probably the biggest building in the North West? [Pub quizzers pay attention] The Devonshire Dock Hall, Barrow-in-Furness was erected in 1985 to construct Trident submarines. It’s an enormous shed with six vast cross-roofs. There are giant folding doors at each end. A ship lifts inside can move 24,000 tons. It is Big. What happens today if Manchester is nuked? Do you know? Accrington is a Lancashire town noted for its hard building bricks used in the construction of the Empire State Building, famous for its football team, and culturally for the town’s art gallery having a large collection of Tiffany glass. It also, briefly, had the chance to be known for the brilliance of its late twentieth-century architecture. In 1968 Accrington Corporation got county council planning consent for a public convenience on the edge of the town’s Broadway car park. It was to be the only building in the area. Borough Architect Raymond T. Duckworth (b.1926) had a hankering for something monumental to rise above the mess of cars. Having seen Sir Hugh Casson’s 1965 Elephant and Rhino Pavilion at London Zoo, (listed grade II* in 1998) he was inspired to take the masonry arc back to Accrington where he executed the design in brick. The plan of the convenience was devised by cutting a disc in half, sliding the cut surfaces together to give two arcs with a short flat edge on either side, leading the Accrington Observer to enthuse “Accrington could well be one of the first places to attempt this bold solution of an old problem by making a virtue out of a necessity, making use of contemporary architecture”. To allow the brick to make a smooth turn, Duckworth selected soldier bricks (bricks on end with the narrow ‘stretcher’ faces showing) letting the mortar between the verticals accommodate the change in angle with each joint. He knew what he was doing; his RIBA thesis was on the history of brickwork in Great Britain. 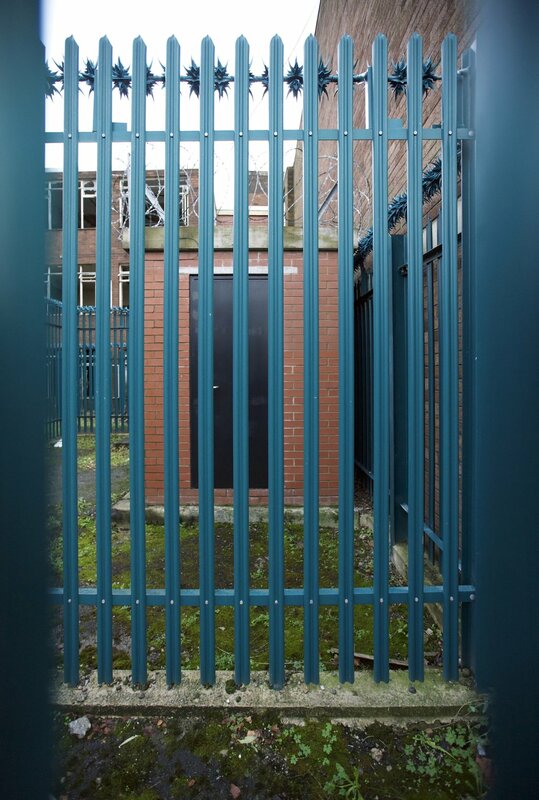 The result, a 'remarkable public toilet' as the Civic Trust for the North West described it, opened in 1970, incorporating dark blue soldiers, timber window frames and an aluminum roof with trimmed parapet. It cost £6000. 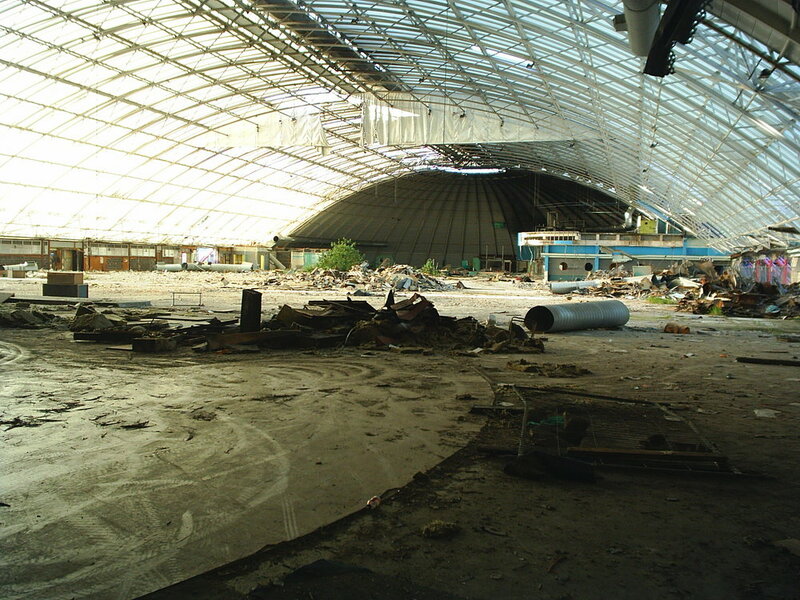 By 2002, the toilet had been demolished to allow the building of a new shopping center. Today the town is arguing about closing some mundane public toilets and boasts of its repro Victorian market. Hyndburn’s motto is ‘The place to be’. There are two Brutalisms, and neither is thoroughly understood nor appreciated. Late in 1953, the Smithsons published a scheme for a house in Fitzrovia, which, with its ‘bare concrete, brickwork and wood... the structure exposed entirely, without internal finishes wherever practicable’ would have been ‘the first exponent of the “new brutalism” in England’. This was also the first appearance of the term. The approach was elaborated in the Architectural Design for January 1955. Theo Crosby rejected ‘contemporary’ modernism in favour of formal classical proportion, as was being expounded by Rudolf Wittkower, and the Smithsons looked to the principles and spirit of Japanese architecture and peasant dwellings. The Smithsons wrote of a ‘reverence for materials’ without singling out concrete, and their modest (unlisted) house for Derek and Jean Sugden then being built in Watford is Brutalist in its unplastered brickwork, exposed concrete beams and simple tiled floors and timberwork. It is a house easily taken for granted: simple yet radical, with an underlying balance between formality and awkward elevations were taken from de Stijl and the Maisons Jaoul. With nothing else to build and a savvy for self-promotion, the Smithsons made Brutalism Britain’s most important contribution to international architecture after the Arts and Crafts Movement. That international perspective is worth remembering as its greatest monuments are needlessly altered or destroyed. How different is this original Brutalism from what can be called ‘High Brutalism’ in the manner that High Victorian Gothic evolved from the simple lancets of Pugin and his contemporaries? The scale was expanded and the architecture became more expressive in buildings like Sheffield’s Park Hill and Castle Market, Manchester’s Piccadilly Plaza and Gateshead’s Treaty Centre, but while the continuing low budgets and greater size favoured concrete over brick and timber, the pursuit of honest forms and finishes remained. For a moment in the 1960s Brutalism’s cheapness and flexibility united the public and commercial sectors, and north and south; at the end of the decade, the Smithsons gave it an added intellectual nous with Robin Hood Gardens. Yet was Brutalism ever as truly fashionable as now, in its moment of destruction? What does an architecturally prestigious hotel in Turin have in common with Paris’s Pompidou Centre and fans of 1960’s English film The Italian Job? The Lingotto factory was completed in 1922, the year of Mussolini’s March on Rome. The fame of its architect Matté Trucco, previously a naval architect and engineer, rests alone on this unique edifice. Built in reinforced concrete and covering an area of 400,000 square metres, Lingotto was a forerunner of the aesthetic of later celebrated Italian architect, Pier Luigi Nervi. The incredibly long building had two outrageous helicoidal ramps which led up to the track. Its audacity made a tremendous impression on foreign visitors and Le Corbusier immediately used an illustration of the factory to demonstrate his own principles in Vers une Architecture, published in the same year: ‘One of the most impressive sites in industry’, the master waxed lyrical, ‘a guideline for town planning.’ Lingotto figured prominently in the first Exhibition of Rational Architecture held in Roma in 1928 and Gruppo 7 later declared it the only fundamentally industrial building in the whole of Italy with any architectural value. Sadly, by 1978 the Lingotto parent plant was considered, by a now globalised FIAT, to have become old-fashioned after the introduction to its other factories of Robogate, a flexible robotic system for assembling bodywork, later celebrated in the Spirto di Punto TV ads of the 1990s. Lingotto’s closure in 1982 led to frenzied polemic about the site’s future, part of a wider international debate surrounding industrial decline and the perceived move across the Western world from modernist production to post-modernist consumption. Genoa born Renzo Piano, flushed with success after the completion of Paris’s Pompidou Centre, and latterly responsible for the regeneration of his home-town’s waterfront area in time for Genoa’s turn as European City of Culture in 2005, won the open competition to revamp the site. He envisioned a modern public space for the city containing concert halls, a theatre, a convention centre, shopping malls, a hotel and new buildings for Turin Polytechnic. This opened in 1989. Fancy a look? The Lingotto building is featured extensively in the Alberto Lattuada film Mafioso (1962) and, of course, during the getaway sequence of The Italian Job (1969). Or if you’re feeling flush, next time you weekend in Turin head for Via Nizza on the brand-new Torino Metro (station Lingotto M1, opened March 2011) and stay in Piano’s hotel, from which you can access the roof-top track and admire the cantilevered design, the 16,000 piece translucent roof and other utilitarian factory wonders. A gallery contains a series of poignant photos, prints and plans relating to the economic boom decades and the hotel’s guest rooms are unusually large and loft-like, reflecting the building’s heritage. And – wouldn’t you just know it - there’s shed-loads of parking! Meanwhile, down the road at Mirafiori, FIAT continues to employ 15,000, (down from 27,000 in its heyday), many of them the grand-children of those first 50’s economic migrants. In a strange act of historical circularity, the company recently replaced the bicycle sheds it had gutted in the 1970s (when an earlier generation of workers had abandoned their bicicletti in pursuit of the automotive dream) due to increased demand from its contemporary bike-riding employees. I shall start with a declaration that sadly feels like it should be a confession. I love Essex. Essex is perhaps the most maligned and derided county in contemporary culture; it's become a shorthand for class prejudice and vulgarity; the target of countless cheap jokes. I believe this is desperately unfair and I trust, dear modernist, you are open minded enough to seek the true beauty in the area. I can't claim there is no ugliness; of course like everywhere Essex is multifaceted and has its troubles but it also holds many thrills. Frustratingly space here allows only a whistle-stop tour of a few of its delights, so here then, in chronological order, are five of my favourite places in modernist Essex. Like the other sites I am highlighting, Canvey's fashionable heyday is over; it is no longer a bustling seaside resort but still I am enchanted by it. Largely cut off from the mainland, crossing the bridges means encountering an array of diverse environments. You can find dilapidated funfairs, lush nature reserves, behemoths of the petrochemical industry and a 17th century pub. Of special interest to the modernist are the sumptuous curves of the International style Labworth Cafe, Ove Arup's only building. Designed to resemble the bridge of the Queen Mary it has undergone various modifications, including a lamentable change of typography during its 1990s renovation. However, I believe it is still a stunner. To appreciate Canvey’s melancholic charm at its best I suggest visiting on a blustery day and lingering in the Labworth over a large gin and tonic. The view from the window is not a twee seaside idyll but the blood, guts and toil of the Thames estuary. Captivating. Thomas Bata had a vision to shoe the world – and a mission to marry Garden City paternalistic care for workers (and increased productivity) with a brutalist aesthetic. Zlin in Czechoslovakia was his capital but satellite towns sprung up across the world, including a stunning enclave in East Tilbury. A workers utopia, where the line between sympathy and surveillance were intertwined, it has been called “the most modern town in Britain...Life in Bata-world seems to have been a cross between a holiday camp and a prison camp. The town had its own newspaper, and there were activities and facilities galore, but beneath it all was an almost cult-like corporate philosophy” (Rose, 2006, The Guardian). The shoe Factory is now closed and the Thames Gateway redevelopment threatens the area but Bata remains cherished by many residents. Frinton confounds the usual Essex – and indeed Modernist – stereotypes. It had no pub until 2000 and battled to keep wooden level crossing gates; it is associated with conservative values and exclusivity. However, it was here Oliver Hill was employed to design a seaside wonderland. Ambitious plans were made for a resort, including a cliffside hotel to eclipse his Midland in Morecambe. Hill “ensured that the tone of the estate would do nothing to attract day-trippers from London, keeping Frinton for the well kept and well bred, whilst making the estate a showcase for modern British design” (Oxborrow, online). Plots were allocated to the cream of contemporary architects and the Information Bureau (now The Roundhouse) was opened. It showcased cutting edge design and featured a mosaic of the estate layout by Clifford Ellis on the floor. However Hill's vision was frustrated by practicalities including a building society that would not fund concrete constructions, inexperienced builders, and a climate which put commerce above aesthetics. Work halted in 1936 with only a fraction of the houses realised; sleek curves and classic white modernist dwellings incongruous near rows of Victorian beach huts. A dream of a brave future the rest of the town failed to embrace. In my opinion the most splendid of The New Towns, Harlow's design was led by Frederick Gibberd. The Lawn was Britain’s first residential tower block; the nuance and care taken in its design is apparent in the south facing balconies every flat enjoys. Harlow also boasts the first pedestrian precinct, an extensive cycle track network and an array of other notable buildings, although sadly the original town hall and sports centre have been demolished. Perhaps most remarkably it has a lavish collection of public art thanks to the Harlow Art Trusts vision that everyone has the right to enjoy quality art and design every day. The Water Gardens stunning vista has been somewhat spoiled by adjacent redevelopment but there is still much to admire. William Mitchell's gorgeous concrete reliefs are an integral part of the pools and the surrounding area includes work by Henry Moore, Elisabeth Frink, Ralph Brown and others. Sculptures can be found nonchalant but proud in civic buildings, schools and shops. The sadness of course it that this should be so unusual and that every town does not seek to integrate creative design into banal spaces. From its inception the new university embraced the modern, aiming to widen participation and be as accessible as possible. They sought to create an environment that would encourage interdisciplinary working; initially a philosopher was appointed in every department. 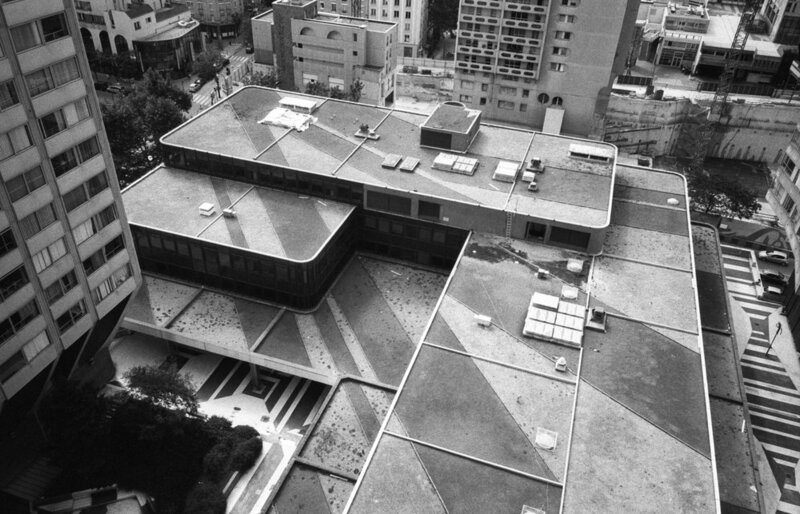 Kenneth Capon, the architect, took inspiration from San Gimignano in Tuscany, building a campus based on public squares and towers which would nurture collective endeavour and creative practice. The functional elegance of the library makes it stand out even in such exceptional surroundings. It also features – be still my beating heart! - a fully operational paternoster lift. A stunning place to work and study. Alas, there is no time to champion The Royal Corinthian Yacht Club, The Dell, Silver End, or any of Southend’s fabulous ice-cream parlours. But if you fancy a tour I'll meet you outside Rossi's at 6. When this article about the Liverpool International Garden Festival was conceived, I had a clear notion of how it would unfold: I'd describe the flash-in-the-pan Utopia created in 1984, something I presumed to be the last throw of the dice by a socialist council whose city had been decimated by a ruthless Conservative government. I'd then of course go on to bemoan the lack of a legacy, the wastefulness of letting the Festival site decay and the short sightedness of the model of regeneration that never thought, "but what next?". In the timespan it covers we have seen one complete cycle — bust to bust. The city’s regeneration boom, neatly bookended by two tourism-centred initiatives: the Garden Festival and 2008’s Capital of Culture. I was hoping to be cynical about this. Unfortunately, I was wide of the mark. Thankfully, my lines of enquiry blew open my closed opinions. Firstly, I spoke with my Scouse family. Like many Liverpudlians, they are vehemently anti-Tory. Had my Auntie Edna known she was to die in middle age, she would have gladly taken out Margaret Thatcher first and spent her last joyous days in prison. As such, it was with great surprise that I learned that they had a lot of respect for one of Thatcher's ministers. Yes, it was in fact Michael Heseltine who decided something must be done to halt the decline on Merseyside when his own party wanted to simply cut it adrift. Secondly, I talked to local writer and self-confessed "Liverpool anorak" Kenn Taylor. Both he and my relatives were as unanimous in their praise for the Festival as they were disparaging of the Derek Hatton-led Labour council of the day. Heseltine wanted to ease the memory of the Toxteth riots of 1981 and turn Boys from the Blackstuff-era Liverpool into a destination for visitors and investment. Alongside saving and developing the Albert Dock, cleaning the Mersey Basin and creating new technology parks at Wavertree and Brunswick, it was determined that a Garden Festival, based on the German Bundesgartenschau — a bi-annual regional development initiative originating in Hanover in 1951 — was to be organised. The site, a sludgy former oil terminal, was dredged and infilled in the largest urban reclamation project ever executed in the country. Two hundred and fifty acres of parkland, sixty ornamental gardens, and numerous pavilions and artworks were created. My granddad was bought a season ticket and went almost every day, such was local love for the Festival. Celebrities of the era, Acker Bilk, Worzel Gummidge, and SuperTed were all in attendance. For nine months Liverpool attracted over three million tourists, people who previously wouldn't have dreamt of visiting. There was pride in the city again. In time the Festival ended and then… nothing. A pamphlet had proclaimed that the Festival Hall was to become "the centrepiece of a planned housing, business and leisure development, for use as a multi-purpose sports and leisure centre". Unfortunately the only sport and leisure that took place on site was quad-biking and dogging. Not forgetting the ill-fated Pleasure Beach amusement park that lasted from the late 80s to 1996. Despite failing to use the land itself, all was not lost. Two vital things had come from the Garden Festival: the symbolic gesture that Liverpool wasn't dead; and a model for leisure-led regeneration. Whilst the Festival site languished, other Garden Festival Cities such as Stoke and Glasgow implemented the next phases of their development, and places like Manchester and Birmingham Urban-Splashed their way to success by adopting the development template that in some ways was pioneered in Liverpool. It wasn't until it was gearing up for the Capital of Culture bid that Liverpool belatedly caught up with the style of cultural regeneration it had previously experimented with. A chain reaction had been catalysed that in turn has led to the events of 2008, alongside what Taylor calls "the single biggest thing to happen to the city in the last twenty years” - a shopping centre on a grand scale: Liverpool One. Although it pains me to admit it, cities are built on commerce, and in the absence of new industry the fact is that developing a huge shopping experience on privatised city centre land has helped Liverpool to draw level with its peers. At least it is reasonably architecturally interesting. Far from merely framing the sequence of bust to bust, Liverpool, and in particular the Garden Festival, has arguably provided a direct model for the culture-led regeneration of the UK's cities. It's just that where the Garden Festival itself occurred was not where this happened. This boom of regeneration was the face of the supposedly limitless growth that certainly caused the recent bust, but we might now be in a position to ensure that the "what next" for the city — post Capital of Culture and Liverpool One — isn't the same as what happened to the Festival site.